Contemporary Wine Cellars Designs Texas White Rock Lake Project.. 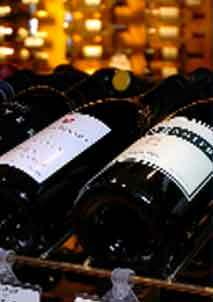 Here at Wine Cellar Specialists, not only do we do traditional wine cellars but contemporary wine cellars as well. What you’re looking at is a plan of a contemporary wine cellar that we completed recently in the White Rock Lake area of Dallas, Texas. This is the drawing for the iron that we did for the 2 sidelights and the door. This is the front section of the wine cellar. (photo on the left) This is the rack system or the rack drawing. We’re showing 3 rows of racks between each of the dividers, going for the ceiling starting 6 inches from the floor and 6 in from the ceiling. Moving on to the photos of the completed White Rock Lake Are Dallas TX custom wine cellar, you’ll see this is a beautiful cellar; all the iron work in the front, the iron dividers, showing the LED tape lighting behind and our Vintage View wall-mounted wine racks. This cellar has LED recessed lighting in the ceiling that is dimmable, as well as the LED lighting that is dimmable shining toward the racks. We used an HS4600 ducted split wine cooling system which has supply and return vent in the ceiling to cool the cellar. The unit has the vents going down through the walls and underneath to the floor, under the floor, to the cross face below where the system actually sits. We used closed cell foams in the walls and ceiling, and we’re going to show you a few more pictures here of the cellar. 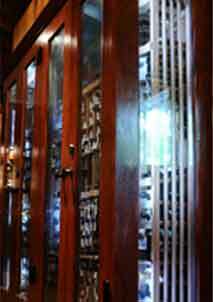 This is when the door is open, and the vintage view racks exposed on the wall. Here you can see a little better; the lighting is shining toward the bottle from the dividers. 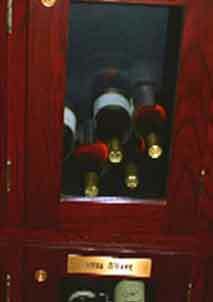 This is another view of the right side of the cellar (through the glass). (photo below) This is the handle and lock. We chose a handle that matched all the other handles in their home. Another bottle views here and back to our main photograph of the complete wine cellar. 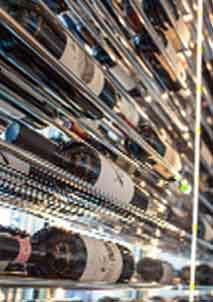 This is a beautiful contemporary wine cellar at White Rock Lake area of Dallas, Texas. Give us a call at Wine Cellar Specialists in order for us to design and install your own wine cellar, whether it is contemporary or traditional. We work with people all across the nation.